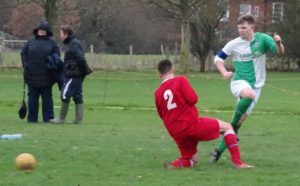 Icklesham Casuals 1st team got off to a flying start in their league match against Mountfield United at the Recreation Ground last Saturday with two goals in the opening four minutes. Firstly, Liam Sayer passed to Danny Noakes who set up Sam Norman to score with a low shot and then Sayer neatly turned in a cross at the near post. After the poor start Mountfield came into the game and created several chances to reduce the arrears in the opening half with Jason Soan making some good saves in the Casuals goal. 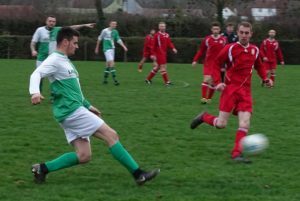 In the 55th minute Steffan Davies was tripped in the area and picked himself up to convert the penalty to make it 3-0 only for Mountfield to reply almost instantly with a penalty of their own for 3-1. On 77 minutes a Mountfield defender lost his footing midway inside his own half and before he could recover Joe Fraser nipped in to steal the ball, ran forward and crossed for Norman to finish from close range to complete the scoring. In contrast Icklesham’s 2nd team started their quarter final of the Cooper’s Construction Challenge Cup away to Sovereign Saints II poorly. They saw little of the ball early on and went 2-0 down. Lee Pierce’s goal brought them back into the game and they pushed for an equaliser in the second half going close when George Barrow struck the post only for Saints to get a third goal to make the tie safe. The final score was 2-1 to Sovereign Saints. This Saturday, January 26, the 1st team have another home league game against Crowhurst with the 2nd team again in cup action away to Sedlescombe Rangers III in the Hastings Lower Divisions Cup.